Pašreiz BMWPower skatas 44 viesi un 41 registreti lietotaji. Nice ride, but i don't think that there is e34 m5 touring in Latvia, Lithuanians for sure have one. Is of the 6 speed M5? But with a 3,0L V8? can you tell me how or where you'we find out theese win nrs'? 1992 / 06 GREY (GD62918 ) = my friend had it in Sweden. Bought from a pilot in Germany (1 owner). Sold to dallas. = Komplette Holzverkleidung in "Nussbaumwurzel hochglänzend"
Achtung: Ersetzt Produktionsauftrag vom 06.03.92. No A/C is this M5. 1993 / 05 BLUE (GD63845?) = looking at the build lists there were three (3) 3.8s built in 5/93. 2x Avusblau (sold to Spain and Belgium) + 1x Mauritiusblau. This car is Mauritiusblau so it must be GD63845. It was for sale at ss.lv. I was mistaking it for Avusblau first. M5 3.8 saloon 1994 / 11 GREY (GD64556)= this forum. Individual order interior. Very rare. Only 1x built. Does it have a M30 motor? I can check how much these cars costed in DM when they were new, if someone is interested? The VIN is right, but this car has no imobilaizer and no climate control, just A/C, so ther's something wrong with your options list. So I decided to sell it. 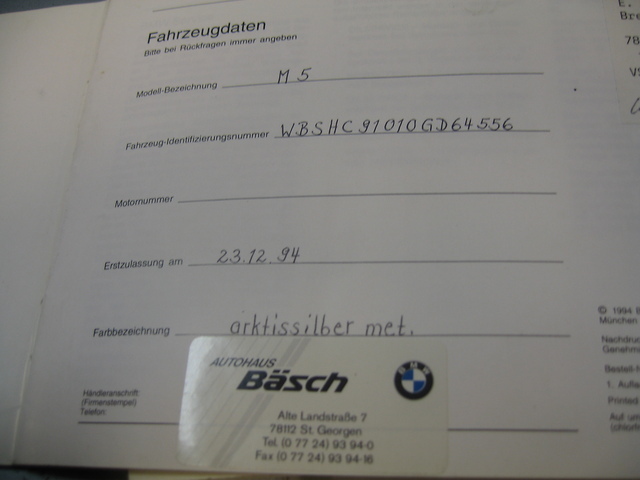 The immobilizer (EWS I) is always built in from january 1994. There is no "key" for it though, so you dont see it. But it is there and this means other Motronic-box etc. 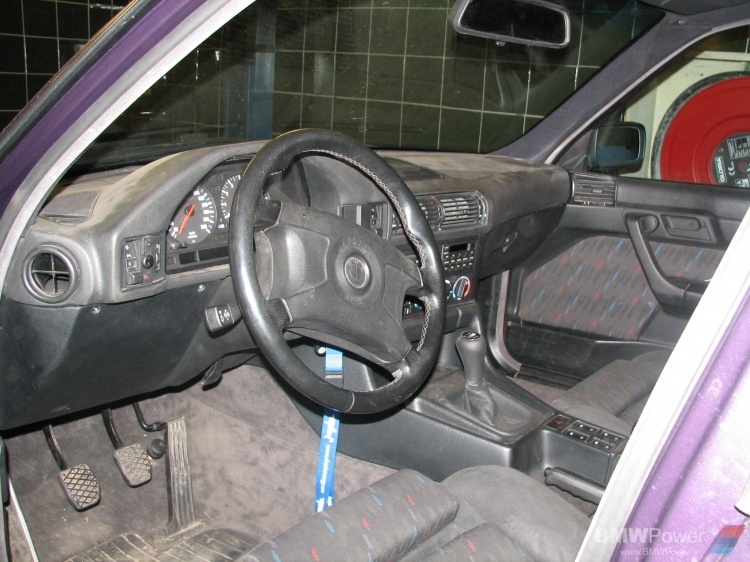 From 1/1995 there is the EWS II in all cars. Klimaanlage (530) means "A/C" in German language. If it had the automatic climate control it would have been 534 Klimaautomatik instead. Good that you saved it. It would be bad to see it wrecked. Maybe the owner would like a 3,8L-Motor? My friend has one for sale (25000 SEK). 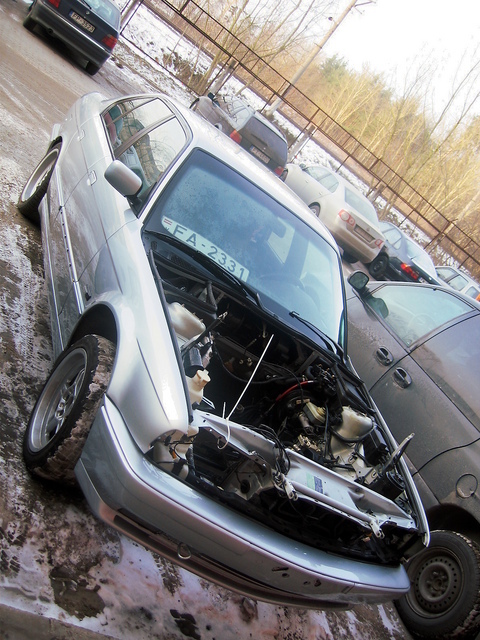 I sold that car more than a year ago, and it has been sold twice after that, now haven't seen it for a while..
HD 91 you can look here, how Se7en rebuilded his e34 m5.